$15.00 minimum donation in cash/check or an unwrapped, new toy or gift for children infant to 17 years old. Gift Cards (think Movies, Target, Best Buy, Gap, etc.) are especially appreciated for the teenagers. Toy and Donation Drop off & Refreshments from 7am - 7:30am. All proceeds go to St. Stephens Episcopal Parish, Aids Outreach Ministry for distribution to needy children in the Miami areas, Coconut Grove, Homestead, Perrine and Cutler Ridge, areas. Twice as many children need our help this year. Please make this holiday a special one for all the needy children and young adults in our community. Refreshments will be donated by EBC and will be served before and after the ride (all toy and cash donations preferred in the morning at ride start please). The Toy Ride will have three ride levels this year. Bring the family; bring a friend to this festive charity event! Most importantly bring cash, check, a gift card or a toy!! Ride Destinations to be determined the morning of—either North or South. This is an EBC official ride and signature release and helmets are required to ride. 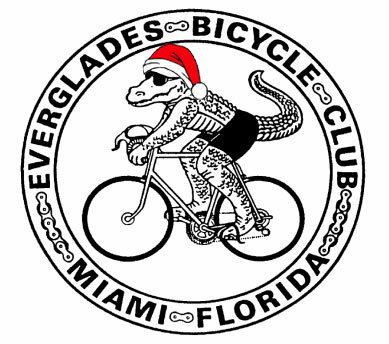 For more information visit the Everglades Bicycle Club website.